Unless your business is seriously Business to Business (B2B) you might not think of using LinkedIn as a social media platform. 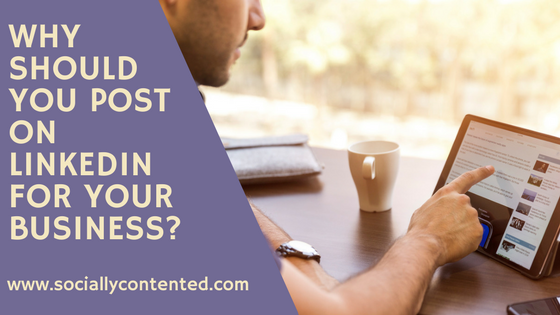 Even if you do, you may have a business page on there which you dutifully post to. But what if I told you that using your personal profile on LinkedIn would work better? 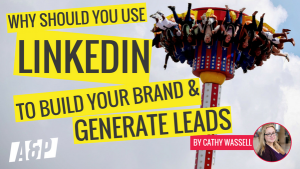 And what if you could get better reach and visibility on LinkedIn than any other platform? Business page or LinkedIn Personal Profile? It’s natural to want a business page on LinkedIn, no matter what the size of your business, and a no-brainer if you are part of a big organisation. But is posting on a business page effective? The answer is, you won’t be surprised to hear, “it depends”. A household name is likely to have plenty of followers, so will have no trouble being visible in the LinkedIn feed. But a SME will struggle as a business page on LinkedIn unless there is employee buy-in. All employees need to be sharing and commenting on the business page posts to give them the visibility they need on other people’s timelines. This means sharing every post, commenting on them and engaging with people who have been identified as appropriate influencers for your business. If you don’t have that kind of employee buy-in, but you do have a number of employees, incentive schemes to encourage post sharing have been known to work well. But if you only have a few employees then growing a business LinkedIn page is a hard slog. You need it if you want to advertise on LinkedIn, but otherwise you may be better using your own personal Profile. So what should you post on LinkedIn? You see an interesting article, and post it to your LinkedIn account. But the LinkedIn algorithm doesn’t like people being taken away from the platform and it won’t favour your post in the feed. If there is a link, it can be better to type it in the first comment rather than in the post itself. Just as on the other platforms, it pays to post content which invites engagement. People love to give their opinions, so asking for advice or recommendations, asking opinions on which to choose from a range of designs or tapping in to an ongoing news theme. I recently wrote a couple of posts about some controversial marketing campaigns. Brewdog launched a beer ‘for women’, Pink IPA, which was the same as Punk IPA on the inside but different on the outside. Just as on Twitter and Facebook, everyone had an opinion on this and they didn’t always match! 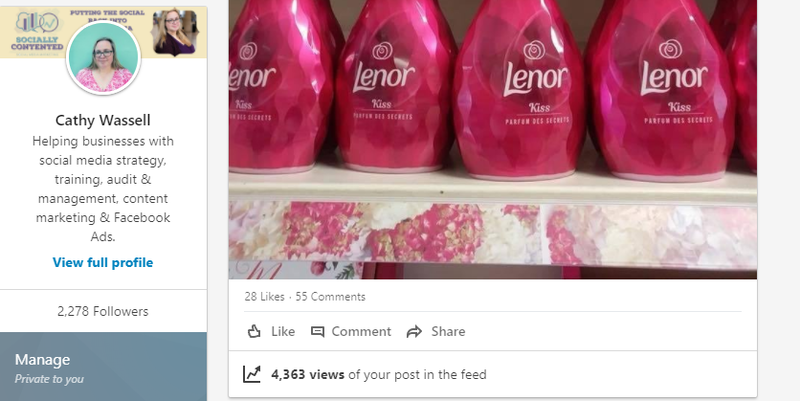 Tesco, perhaps by accident perhaps not, created a Mothers Day display which included pink bottles of Lenor fabric conditioner. Naturally, this didn’t go down particularly well and people weren’t shy of saying so. Showing a personal side and telling a story works just as well on LinkedIn as on the other platforms. It’s all about the story. 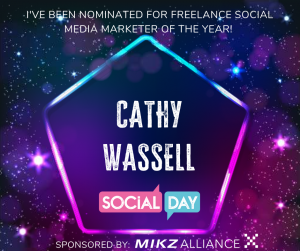 Natively uploaded video was introduced to LinkedIn last year and just as on Facebook, Instagram and Twitter it is favoured by the algorithm. Interspersing your posts with videos can increase the reach of all your posts over time. Being personal on LinkedIn used to be frowned upon as being unprofessional, but the platform is changing. Telling your personal story is a great way to encourage engagement. As yet, LinkedIn hasn’t become overrun with video so it’s still something that makes you stand out. Your video can be up to 10 minutes in length or 5 GB in file size. Since people often browse LinkedIn in the office, it can be useful to have your video captioned with subtitles. There are a few apps which will do this for you, but if you are part of the Apple family, Clips is free and pretty good. 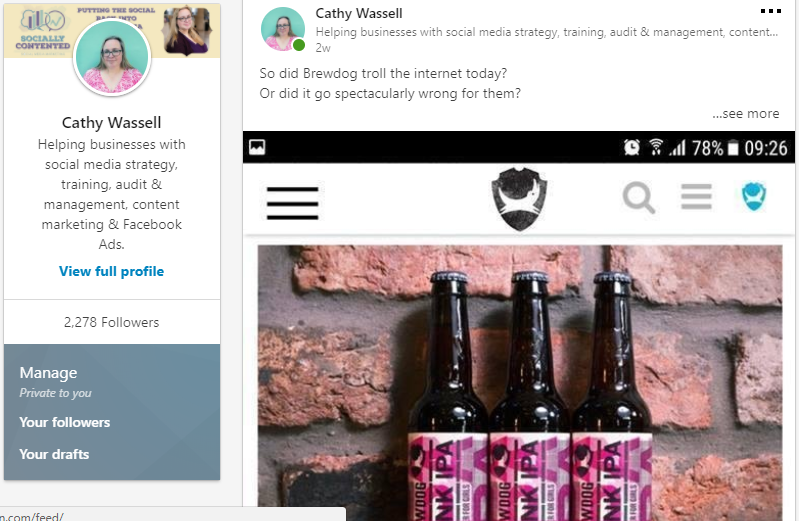 If LinkedIn introduces LinkedIn Live – and why would they not? – make sure you are on it. Publishing an article on LinkedIn is a good way of gaining some traction on the platform and will help you to be seen as a thought leader and expert on the subject. While posts are the shorter pieces of writing that appear on people’s timelines, publishing an article is like writing a blog. Articles can be up to 40,000 characters, and I use this format to promote my blog posts on LinkedIn. Instead of posting a link to my blog (which takes people off the platform and is not favoured by the algorithm) I post the blog here a few weeks after publishing it on my website. I may change the wording a little, but Google has already recognised my authorship on my site by that point – that’s why I wait a few weeks. Groups used to be the big thing on LinkedIn, but over time they got horribly full of spam to the point that many people stopped using them. I am still in a few groups, but I very rarely read notifications I receive for them, and there is only one I visit which contains my peers and is totally spam-free. Having said that, LinkedIn recently announced an overhaul of Groups so we can but hope that they have plans to tackle the spam and Make Groups Great Again. Presuming you are ready to up your LinkedIn time each week, here are some tips to help you make the most of that time.
? Before or after you post, spend time engaging with people whose opinions matter to you (or your business). Comment on their posts, don’t just ‘like’ them. LinkedIn is still a networking platform, and relationships matter. Plus the algorithm will love you!
? Write some posts which contain only text. They do surprisingly well on LinkedIn. Posts can contain up to 1300 characters and long posts seem to do better than short ones.
? Make sure your profile is optimised, with a headline that really says what you do without any wasted words. Don’t bother telling people you are ‘professional’, or ‘enthusiastic’ in your headline. This should be a given. Use the keywords which are important for people searching in your niche, without being spammy. Add a banner image too, as well as the usual headshot. This is essentially free advertising space LinkedIn are giving you so don’t waste it! As you can see on my banner image below, part of the centre of the image will be obscured by your profile photo, even more so on mobile, so factor this into your design. The optimal size for a LinkedIn banner image at the time of writing this blog is 1584 x 396 pixels.
? When you are writing the text of your post, remember that only the first three lines are visible on people’s timelines before they need to click the ‘see more’ button. Your aim should be to get them to click that button. This communicates to the algorithm that your post is interesting, and more people might like to see this post and all your other posts too.
? If you share someone else’s post, make sure you tag them because crazy as it sounds, LinkedIn won’t send them a notification. In general, notifications can be a little frustrating on LinkedIn.
? Make your posts visually interesting too, at least some of the time. You might be writing a text-only post, but you can still spice them up a little with emojis. Not all emojis worked on LinkedIn, but some do and you can use them to make lists a little more interesting, or to convey reaction. You can install emoji keyboards on your browser to make this easy. 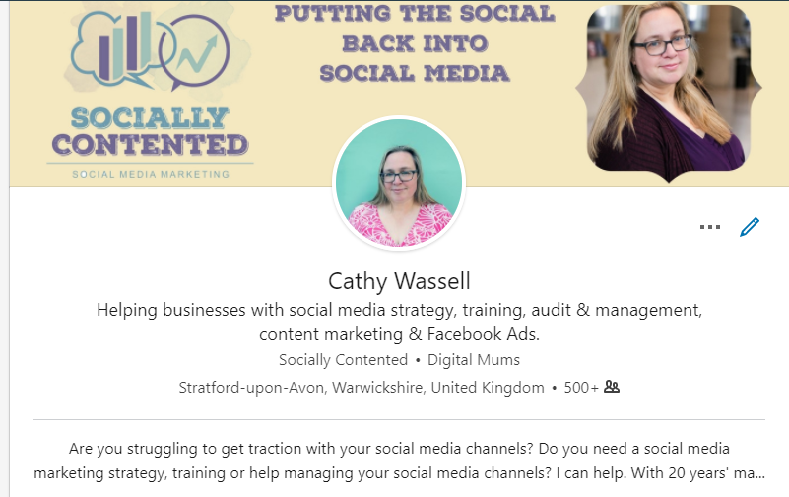 For more tips on social media and the latest updates, why not join my FREE Facebook group. If you would like to see what I am posting on LinkedIn please feel free to follow me here.